Not concerned with earning Hunt Test titles? Looking for a great partner to join you in bird, duck, waterfowl, pheasant, and shed antler hunting plus a great family dog the rest of the year? Let us Customize a training program just for you! Regular coaching and private lessons taught by Professionals are an important aspect of keeping you and your dog at the top of your game. Unlike most Gun Dog Trainers who don't even want you to visit. 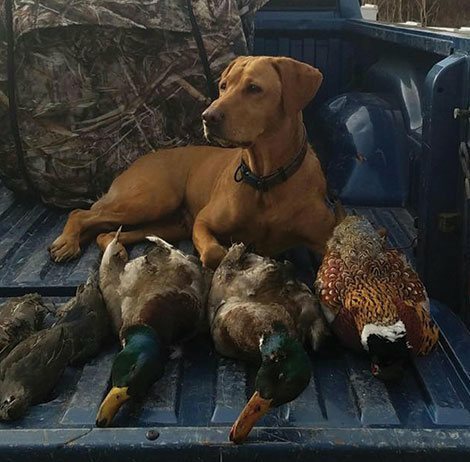 At TK Hot Retrievers we understand to get the very best out of your dog during the hunting season it is critical for the owner to know how the dog was trained. 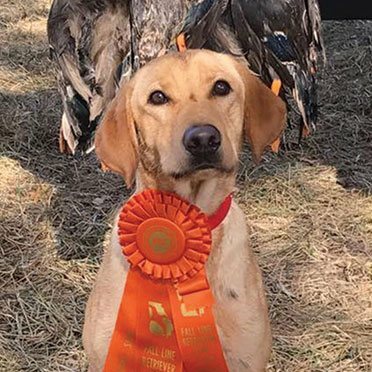 TK Hot Retrievers takes "The Team" approach to training. Meaning "The Team" consist of "The Dog, The Trainer and The Owner." Each member is critical in the process of a well trained Dog. We want your experience at TK Hot Retrievers reach well beyond your expectations. We schedule monthly visits and lessons to ensure your "Teams" continued success. Monthly visits are ALWAYS the 3rd Tuesday of each month. We are dedicated to your dogs education 24/7/365. While most trainers leave the dogs in their kennels on their “Days off” at TK Hot Retrievers our team interact with your dog on a “DAILY” basis. From the structured training lessons of Obedience Work and Field Work to just letting them be dogs and run in our pasture we understand that dogs are creatures that need daily stimulation both mental and physical. The only time your dogs “Spends” significant time in their kennel is at night when they are comfortably sleeping and relaxing. On their “Days Off” from work they are spending time socializing with the other dogs in one of our 3 “Training” yards enjoying time running, playing or just laying in the sun. Please respect that we are here to help your dog reach its fullest potential. During Training Days will are not always immediately able to answer calls, emails, texts. However during our breaks we will get in touch with you promptly. Just like building a Dream Home, when developing your Dream Gun Dog EVERYTHING starts with a strong foundation. The Started Gun Dog Program offered by TK Hot Retrievers begins your dogs foundation by waking up and stimulating their natural instincts. Birds, Birds and More Birds. Its always been said “Can’t have a bird dog with using birds”. To build a Bold, Confident and Enthusiastic Retriever we start by activating their brain through their nose. 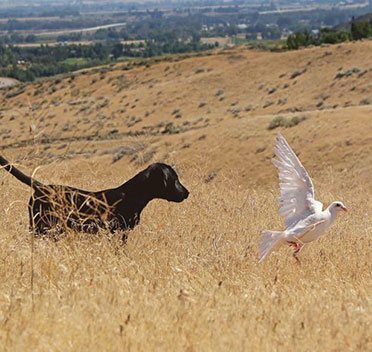 From the first clipped wing pigeon, to chasing a running Pheasant your dog will be exposed to a wide variety of birds in this early training process. Then, using specific exercises designed to challenge a young dogs mind and body we teach foot / eye coordination drills to develop the dogs ability to handle challenging obstacles encountered during the hunt. From downed logs to stuff thorny cover we teach your dog how handle a multitude of obstacles and situations. And finally the control work. Nothing ruins a good hunt like an out of control disobedient dog. From basic manners to advanced OFF LEASH control your dog will be the envy of your friends and hunting partners with his stylish and immediate responses to your commands. Upon successful completion of the Started Gun Dog Program your dog will confidently an enthusiastically difficult single retrieves over land and water. Have both basic manners on leash and advanced off leash obedience skills, Have mastered the “*Trained Retrieve” and happily deliver the bird to your hand, have completed very comprehensive remote collar work, been introduced to various guns at distances and close ranges as well as learn to work through decoys from lay out blinds and holding blinds. Sit, Down, Stay, Place, Heel, Here/Come, Wait at Doors, Load into Kennel, Load into Truck, Leave it, Quiet, Off. Single Marks (out to 150 yards), *Trained Retrieve “Fetch” (Pick up, Hold and Deliver), Give - Release Bird, Come in Whistle, Sit/Stop/Attention Whistle. Our Most Popular Gun Dog Program! Upon successful completion of the Started Gun Dog Program your dog is now ready to learn more advanced Gun Dog and Hunting Skills. He/She is now eligible and ready to enter our *Transitional / Intermediate (Senior Hunter Level) Gun Dog Program. Once finished your dog will confidently retrieve Singles and Double Retrieves over land and water. Run blind retrieves out to 150 yards. Stop on a whistle, Cast Left, Right and Back. Have both basic manners on leash and advanced off leash obedience skills, Finished the trained retrieve and will enthusiastically retrieve to hand, have completed comprehensive remote collar work, been introduced to guns at distances and close ranges as well as learn to work through decoys from lay out blinds and dog blinds. 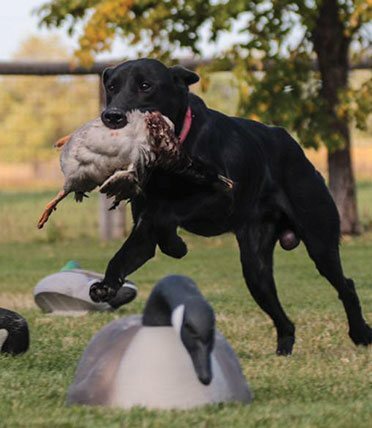 Your dog will be completely steady to shot and will honor another dogs retrieve. In addition your dog will also be able to quarter a field for upland game. Successful completion of both the (JH Level) Gun Dog Program from TK Hot Retrievers. This is an upgrade program. Once your dog has shown successful foundational skills from the TK Hot - (JH Level) Started Gun Dog Program. Upon successful completion of both the Started (JH Level) and Transitional / Intermediate (SH Level) your dog is now ready to put the final touches of EXCELLENCE on his Gun Dog Training Education. He/She is now eligible and ready to begin the Finished (MH Level) Gun Dog Program. Once completed your dog will confidently retrieve Singles, Doubles, Triples and Quads Retrieves over land and water. Run Double Blind retrieves out to 200 yards. Stop on a whistle, Cast Left, Right and Back. Have both basic manners on leash and advanced off leash obedience skills, Finished the trained retrieve and will enthusiastically retrieve to hand, have completed comprehensive remote collar work, been introduced to guns at distances and close ranges as well as learn to work through decoys from lay out blinds and dog blinds. Your dog will be completely steady to shot and will honor another dogs retrieve. In addition your dog will also be able to quarter a field for upland game. Successful completion of both the (JH and SH Level) Gun Dog Program from TK Hot. This is an upgrade program. Once your dog has shown successful Foundational and Transitional skills taught in both the (JH and SH Level) Programs at TK Hot Retrievers.